At any point in your adult life, have you ever truly experienced what Financial Freedom feels like? I mean a lot of people have heard that term most of their life but honestly don’t know what it really means because they’ve never experienced it even on a small scale. a term generally used to describe the state of having sufficient personal wealth to live, without having to work actively for basic necessities. That basically means financially independent people have assets that generate more income than they have in expenses. Financial Freedom goes a lot deeper than that. It’s more about being able to maintain a certain lifestyle with very little work and never having to worry about financial expenses. Living a life of financial freedom doesn’t necessarily mean you have no expenses or no debt. It just means you always have enough money coming in that your expenses are insignificant. That includes regular expenses and unforeseen expenses. I’m going to use myself in these examples because I have been fortunate enough to enjoy true financial freedom. This is not bragging, so you understand, although some would say I have earned the bragging rights. Example 1: You know, being a home owner is one thing. You know you will have some major expenses every now and then. It’s part of maintaining your home. But everyone who owns a vehicle, which is pretty much everybody, can relate to this. 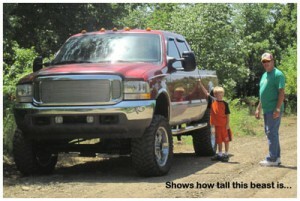 That’s me and my grandson, Ryder, and my big F-250 up on my lake property. Last year I loaded up my jacked up F-250 4×4 and headed up to my lake property for a weekend to myself of relaxing, fishing and cooking out. I hadn’t eaten yet so I stopped at Sonic on the way up. Maybe 2 minutes after I pulled out of the Sonic, back on the highway, I heard a loud thump and all of a sudden I was looking up at the sky. Then I saw my tire and wheel passing me up on the right. My right rear wheel broke off and the back end of the truck, which has a 6.6″ lift kit, dropped to the pavement. Fortunately I was in a low speed limit area and hadn’t even gotten up to the speed limit yet. I gradually applied the brakes and maneuvered to the side of the road. Turns out all the lug bolts snapped. Scared the hell out of me, obviously, but that’s probably not what most people would describe as their first thought. Oh my God, how much is this going to cost me to fix? I called my wife and asked her to look up local Tow services and call someone and tell them where I was. Then jump in my Hummer (H2) and come up there to get me. Being that this was a very large pickup with oversized tires, we had to let them know that up front because a truck that size normally has to be towed on a flatbed. Yeah, more expensive, too. I had the truck towed directly to my mechanic’s shop and left in the parking lot with the keys dropped in their night drop box. I knew I’d get a call sometime in the early afternoon the next day to let me know what the damage was. The hub and axle were damaged and all the lug bolts needed to be replaced but the wheel itself was fine. That saved me some money right there because it’s an aftermarket 20″ chrome wheel. I asked my mechanic to go ahead and replace all the lug bolts on the other 3 hubs as well, to be safe. The total bill with labor? About $2300. When my mechanic told me that I didn’t even hesitate. I just said, “let me know when it’s ready to pick up. Now that alone says a lot about what financial freedom feels like but there’s more to it than meets the eye. Remember I said I asked my wife to jump in my Hummer and come pick me up? The Hummer is actually my main driving vehicle. When she got up there we unloaded the pickup and put everything in the back of the Hummer. Then I drove her back home and went on up to the lake property for my relaxing weekend… as planned. We have 3 vehicles, plus I have a Harley Davidson and we have an RV. All of which are paid for. Of course we still have to pay for insurance and regular upkeep expenses. Having a backup vehicle can relieve a lot of undue stress, don’t you think? Example 2: Here’s a less subtle example of what it’s like to live a life of true financial freedom. Being able to take off and do something exotic and not worry about how much it costs. Back before I got laid off, I wasn’t even married to my wife yet. We were engaged and we were planning on going to Mexico for our honeymoon. I booked an all-inclusive, 5-star resort (Riu Palace) with round-trip airfare for two and paid my travel agent $3250 for the package. Then about 2 weeks later I was laid off. We had to cancel our Mexico trip and go some place local for our honeymoon. 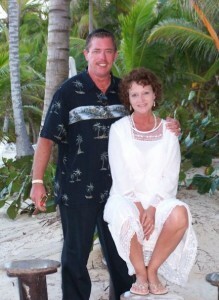 That’s me and my wife Brenda in Dominican Republic. Note the D.R. cigar in my right hand. Neither one of us had ever been to the Caribbean before and we really wanted to go. We talked about it for years before I finally became successful with my home business. Not only was our first exotic trip to that same resort in Mexico but we flew first class. Since then we have always tried to go on a nice vacation, most of the time to a Caribbean location, 3 or 4 times a year. We’ve been all over the Caribbean now and still have a few dozen places we want to go. Plus some of the places we went to we loved so much that we want to go back. We’ve been to Dominican Republic, Mexico 3 or 4 times, Jamaica, Saint Thomas, Puerto Rico, Aruba, Belize, and Honduras to name a few. Think about how Financial Freedom applies in this example. 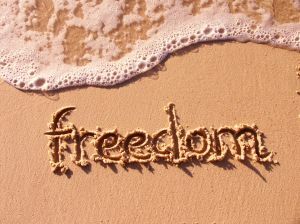 When you are able to pay for nice exotic trips for two a few times a year and not have to worry about whether you can afford it or not, you have a kind of freedom that most people only dream about. Not to mention the fact that we could stay gone for 8 to 11 days and the money keeps coming in even when I’m not actually working. When I’m on vacation I make it a point not to work. The most I will do is try to keep up with emails. Now that, my friend, is what Financial Freedom feels like. I could go on and on with more real life examples. Hopefully you have a much better idea now so you can set your goals and know exactly what obtaining those goals will do for you. I firmly believe that anyone can achieve true financial freedom as long as you have a strong desire and the right vehicle. Your J.O.B., by the way, will never be that vehicle. Click on the big button below to learn about the vehicle that drove me to a lifetime of financial freedom.